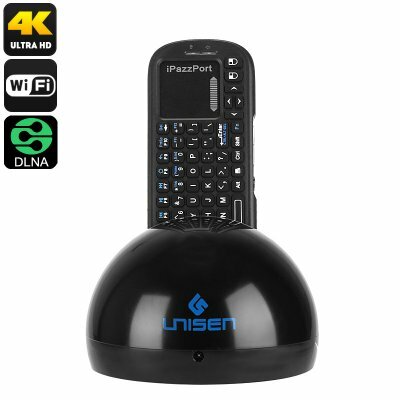 Successfully Added Android 6.0 TV Box - Quad-Core CPU, WiFi, DLNA, Miracast, Double-Sized QWERTY Remote, 2.4G Wireless, 4K Support to your Shopping Cart. This Smart Android TV Box comes with a double-sided remote control that brings along great efficiency when enjoying the latest media and browsing the web. With its QWERTY layout, this smart remote lets you easily write text and search for media while using your TV Box. Additionally, it comes with an abundance of shortcut keys and user-defined function keys that will bring along great efficiency. It even supports a wireless touchpad and scrollbar that lets you easily browse through all the features this Android 6.0 TV box has to offer. With this smart TV box, you’ll be able to enjoy games, movies, and browse the web from the comfort of your sofa. Whether you use it for entertainment purposes or for streaming the internet and giving presentations at work, this Android TV box is sure to meet your demands. Within its compact body, this Android TV box packs a Quad-Core processor that has been clocked at 1.5GHz. Along with 1GB of RAM, it lets you tackle all the basic Android applications. With this TV box at your disposal, you’ll be able to watch your favorite movies and series at any time. Additionally, it lets you play games, browse the web, and use Android Apps. Thanks to its WiFi support and Ethernet port, you can be guaranteed that this Android TV box always treats you to a stable internet connection. 8GB of internal memory and a 32GB SD card slot bring along all the storage needed for your latest downloads from the Play Store or Kodi. By supporting 4K media files and featuring FHD display resolution, this Android TV box treats you to absolutely stunning 1080p visuals. This means that you’ll be able to enjoy your films and series in breathtaking detail and vivid colors – truly enhancing your visual experience. The next time you invite over friends to your place, you’ll never have to be bored again. Play games, watch movies, and browse the web – nothing is impossible for this stunning Android TV box. It furthermore supports DLNA that lets you easily share your media files in between different devices. Additionally, Miracast allows you to mirror all that’s happening on your smartphone’s display straight to your big screen TV. With its simple interface, this Android 6.0 TV box is easy to install and use for people of any age. This Android media player comes with a 12 months warranty, brought to you by the leader in electronic devices as well as wholesale electronic gadgets..